Here at Honey and Dates, we LOVE makeup! When we began this blog, we started researching the ingredients used in makeup. Then came the tears (don’t worry, we were wearing waterproof mascara). Once we took a good look at all the products we’ve been using, we realized the majority of them were pretty toxic! This wasn’t good news. We wiped away our tears (and threw away some of our fav products) and started the search for more natural, organic makeup that was also ethically conscious. And we found hope 🙂 Fear not makeup lovers, for there are plenty of alternative options out there, and best of all, we did all the work for you! Each week we will be covering a different category and will provide you with a list of our favorite beauty products! 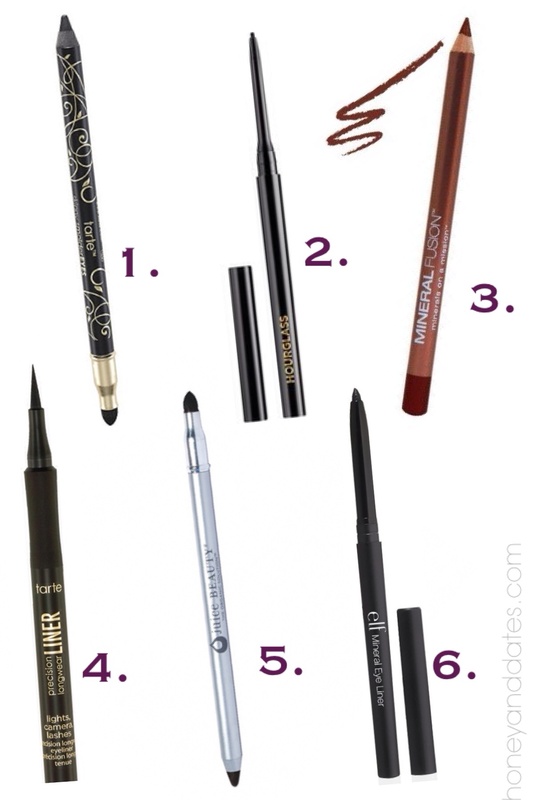 This week is all about eyeliners! “Nearly 90% of the 10,500 ingredients the FDA has determined are used in personal care products have not been evaluated for safety by the CIR, the FDA or any public accountable institution”. As consumers, we believe it’s worth looking a little deeper into the products we use every day and be aware of what we are putting on our bodies. So what are some alternatives? *If you buy directly from tartecosmetics.com you can save 20% on your first order and receive free samples!